How often have you stared at the wall of running shoes in the athletic store and just decided to make no decision at all? Choosing the right shoe for you can be quite confusing without some kind of direction. But if your shoes are old, if the tread is worn out or if your toes are showing through (don’t laugh, I’ve seen it), it’s definitely time to bite the bullet and spring for new sneaks. Now that we’re nearing the end of spring you should have a pretty good idea if your shoes are up to the task of your running routine. 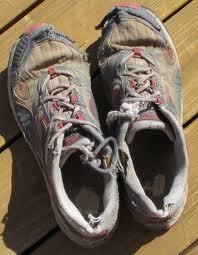 If your ankles, feet, shins, hips, or back are sore after you run, the culprit could very well be your athletic shoes. When your feet strike the surface you’re running on, it creates energy that should be absorbed by the shoe. A lack of support and shock absorption in the shoe may be responsible for letting that energy move upwards through your body until it dissipates, causing stress on your muscles and joints. That equals soreness and pain. Poor support, weak tread and lax construction will be the difference between pain/no pain. I can tell you first hand that the difference between running in a cheap shoe and a shoe that is properly fitted for your foot-type is like night and day. Don’t be a cheapskate when it comes to running shoes. A quality, properly fitted shoe will save on pain, discomfort and a trip to a podiatrist or orthopedist. How do I know what kind of running shoe I need? A good athletic shoe is designed to fit one of three foot types: Neutral Pronation, Underpronation or Overpronation. Pronation refers to the rolling motion of your foot from heel to toe through foot strike. You can determine your level of pronation by looking at the bottom of your shoes. Most will show wear on the outside of the heel, which is normal. The wear on the forefront is what reveals the pronation. Also known as proper pronation, this is when your foot lands on the outside of your heel, moves to the ball of your foot and spreads evenly across the front. This movement is best for pain free running, as the energy is distributed evenly across the foot. If wear on the bottom of your shoe appears uniform across the forefoot, you’re a proper pronator. People with high arches usually are Underpronators, where the outside of the foot takes most of the shock instead of finishing in the neutral position. If your shoe wear is on the outside, you’re an underpronator. People with flat feet are usually Overpronators. Here, there is too much rolling from the outside to the inside of the foot. If your shoe wear is on the inside you’re an overpronator. Check out the shoe advisor from Runners World to find which shoe is right for you. In the video below, Dr Adam Teichman from PA Foot and Ankle Associates and Chris Schmidt from The Finish Line Running Store talk about how to find the running shoe that’s perfect for you. P.S. : If you buy a pair of running shoes at The Finish Line, mention Doctor Teichman or East Penn Foot And Ankle Associates and save ten percent!